Want to do something really revolutionary for your business? I’ve got just the thing: provide exceptional customer service. At ShortStack.com, we talk a lot about how to make the customer service experience better for our users — it’s on the agenda at every staff meeting — because I know it makes a difference in the company’s bottom line. In fact, customer service is such a priority at ShortStack.com that everyone at the company, takes a shift each week answering support tickets. Including me. Why do we invest so much in customer support? The motivation is selfish. We want our customers to rave about us to their friends and colleagues. But we also want to make our existing customers so happy with our product and our service that they have no reason to switch to a competitor, even if the competitive product is less expensive, or easier to use. Are you familiar with the “switching economy?” Even if you’re not, I bet you’ve contributed to it. That time when you switched cell phone or internet service providers, or perhaps chose a different rental car company after years of loyalty to one brand? That’s switching. And it’s very costly to businesses. Chief among the reasons people switch from one brand to another? You guessed it: customer service. One 2013 Accenture study found that 51 percent of U.S. consumers had switched service providers in a variety of industries (including banking, internet service providers, wireless providers and travel) due to poor customer service experiences. According to the same Accenture research, the switching economy puts $1.3 trillion in play for companies offering superior customer experiences. So here’s where the concept comes full circle. What’s one way you can you grab some of that business and, more important, avoid having customers switch away from you? By investing in customer service. Here are five things you can learn from your customer support team that will make your business stronger, make your customers more loyal, and increase your company’s revenues. At ShortStack.com, we are very proud of our 1.0 hour average response time to customer service inquiries. 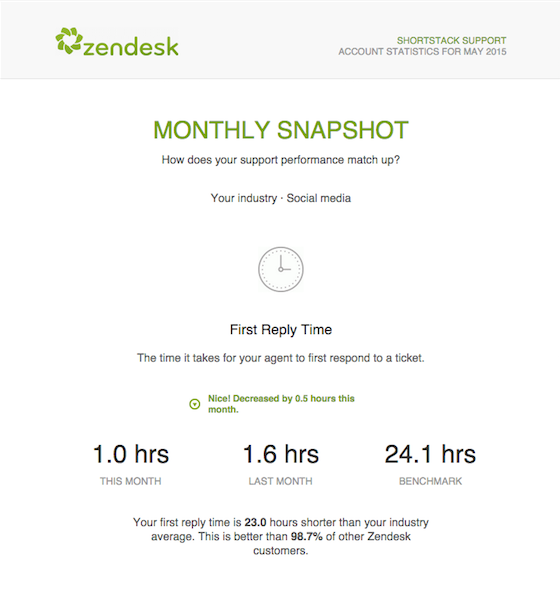 According to Zendesk, the customer support software platform we use, social media companies take an average of 24.1 hours to respond to customer support tickets. That means we’re better than 98.7 percent of Zendesk’s other users. What’s more, our “one-touch resolution” (the percentage of tickets resolved after one interaction with one member of our customer support team) percentage is 36 percent. That’s 14.9 percent lower than the industry average (and 30.1 percent better than Zendesk’s other customers). We’re not resting on our laurels, though. Julie Vienna, ShortStack.com’s Director of Customer Support, says her goal is to get the average support-response time below one hour, ideally less than 10 minutes: “We’re adjusting our agent’s schedules so they’re online during peak ticket-submission times,” she says. Nurturing relationships with customers is integral to any company’s ongoing success. We may live in an age where automation has supplanted the personal touch, which certainly makes some things easier, but in the context of customer service, automation it’s risky. If you aren’t communicating with your customers, you risk losing them, obviously, but you also miss opportunities to make them love you and, ideally, want to tell their friend how much they appreciate your product and service. In my view, a crucial part of customer service is being proactive and anticipating what people might need so they can use our product successfully. Ultimately this will make them want to use ShortStack.com even more. I’ve compared our customer service approach to being more like a sommelier than a clerk at a quick mart. I’d rather have our agents recommend food-wine pairings than simply point customers to the cabernet aisle. Worth noting here: Forty percent of customers says improved interaction with service employees is a key motivation for spending more with a company. Whether you use a customer service software platform — such as Zendesk, Help Scout or Freshdesk — or you rely on telephone support, your customers should trust that your company’s representatives know how to use your product or service. This sounds absurdly obvious, but I know I’m not the only one who’s been on the phone with a customer service representative from a company, only to learn that the rep has no idea how to use the product or service beyond the most basic level. Try thinking of customer service as an investment instead of an expense. If you outsource your customer service to the cheapest provider, and rely on people who don’t understand your customer’s issues, you will lose customers and then lack of customer service will be really expensive. Then take a step further and think of your customer support agents as customer success agents who deserve your support. They are going into proverbial battle on your behalf every day, and it’s not always an easy job. We rely on our customer support agents to let us know when something with our software needs fixing or other updates. We have two distinct fix-it categories. One is “bugs” and one is “feature requests.” Our customer service team keeps the development team aware of both. Customer support folks are the ones who notice when users report issues they’re having with certain ShortStack.com functions. And it’s up to them to let the dev team know when a problem requires surgery instead of a band-aid. During the last five years, we’ve added more than 328 features to ShortStack.com, the majority of them new features that have been requested via customer service. I’ve learned that by listening to our customers we are, in effect, doing R&D without having to invest thousands of dollars on focus groups and lengthy, expensive surveys. Your social media team is the bridge between marketing and customer service and it’s essential that the teams communicate. Even if you think you’re doing a fantastic job using social media for customer service, your customers might not agree: According to one study, only 36 percent of consumers who make customer service inquiries on Facebook, Twitter, etc. say their issues are resolved efficiently and effectively. A whopping ten percent of companies who receive customer service questions via social media never bother to respond at all, according to the same study. Who knows how many of the people who feel ignored on social media decide to switch to another business? I hope by this point you have a better understanding of just how much customer service is worth to a business. In fact, loyal customers are worth up to ten times as much as their first purchase. And it’s six or seven times more expensive to acquire new customers than it is to keep existing ones. Remember, satisfied customers tell three friends and angry customers tell 3000 (according to Advertising Age columnist and author Pete Blackshaw). 81% of customers who’ve left a business for a competitor say the original company could have done something to prevent the defection. 48% of people who’ve left a business for a competitor say if the company they’d been doing business with had recognized and rewarded them for their loyalty, they would have remained a customer. 48% of people who’ve left a business for a competitor say if the company they’d been doing business with had contacted them proactively to let them know about ways to enhance their experience with the company or product, they would have remained a customer. 28% of people who’ve left a business for a competitor say if the company they’d been doing business with had offered better service and support via mobile devices they would have remained a customer. 74% of customers say that having to contact a company multiple times for the same reason is a major frustration. 66% of customers say dealing with employees who are unfriendly or impolite is a major customer service frustration. 80% of companies believe they deliver “superior” customer service but only 8 percent of their customers agree.